Already have a Username/Password for International Journal of Computers Communications & Control? Submission: IJCCC is an open access peer-reviewed journal publishing original research papers and review articles. The authors must read the IJCCC Rules before Online Submission. The manuscripts submitted via e-mail will be ignored by the Editorial Team. All submitted manuscripts will be scanned for identification of similiraties and will be analized by editors for plagiarism prevention (for this reason Submission tax is required). Click here to download the IJCCC Template . The title should be very specific, not too broad and not too long. The title should be substantially different from others. AVOID GENERAL TITLES, e.g., “Research on data mining”, “Contributions to Information Theory”, “Some research on job assignment in cluster computing”, "On the collaborative agents" or “A new framework for distributed computing”. • Motivation: Why do we care about the problem and the results? • Problem statement: What problem is the paper trying to solve and what is the scope of the work? • Approach: What was done to solve the problem? • Results: What is the answer to the problem? • Conclusions: What implications does the answer imply? A good hint is pack each of these part into one sentence. Plan your sections and subsections. Use a top-down writing method. Use a sentence to represent the points (paragraphs) in each subsections. Writing details: expand a sentence in the sketch into a paragraph. Keep a logical flow from section to section, paragraph to paragraph, and sentence to sentence. in the related area. Give credit to other researchers (reviewers are usually chosen from the references). Cite good quality work, particularly when citing your own work, and up to date work. Related work should be organized to serve your topic. Emphasize on the significance and originality of your work. A research paper should be circular in arguments, i.e., the conclusion should return to the opening, and examine the original purpose in the light of the research presented. Assuming that you have decided where to submit, and your paper is ready. Even an acceptance “with minor modifications” is rare. The best scientists get rejected and/or have to make major revisions. It is unreasonable to get defensive, unless it is really called for. You should address EVERY aspect of the reviewers concerns. you have made. Do not add new science unless it is called for. A good referee report is immensely valuable, even if it tears your paper apart. Remember, each report was prepared without charge by someone whose time you could not buy. All the errors found are things you can correct before publication. Appreciate referee reports, and make use of them. An author who feels insulted and ignores referee reports wastes an invaluable resource and the referees’ time. Finally, we have to remember what you put in the literature is your scientific legacy after all else is gone. Papers are accepted for review with the understanding that the same work has been neither submitted to, nor published in, another journal or conference. If it is determined that a paper has already appeared in anything more than a conference proceeding, or appears in or will appear in any other publication before the editorial process at IJCCC is completed, the paper will be automatically rejected. Papers previously published in conference proceedings, digests, preprints, or records are eligible for consideration provided that the papers have undergone substantial revision, and that the author informs the IJCCC editor at the time of submission. If previously published material is reproduced in submited manuscript, corresponding author must provide proof about the necessary copyright permission. Concurrent submission to IJCCC and other publications is viewed as a serious breach of ethics and, if detected, will result in immediate rejection of the submission. DISCLAIMER: The author(s) of each article appearing in International Journal of Computers Communications & Control is/are solely responsible for the content thereof; the publication of an article shall not constitute or be deemed to constitute any representation by the Editors or Agora University Editing House that the data presented therein are original, correct or sufficient to support the conclusions reached or that the experiment design or methodology is adequate. Antiplagiarism. All submitted manuscripts will be scanned for identification of similiraties and will be analized by editors for plagiarism prevention (for this reason submission tax is required). R. Andonie, I. Dzitac, How to Write a Good Paper in Computer Science and How Will It Be Measured by ISI Web of Knowledge, INT J COMPUT COMMUN, ISSN 1841-9836, 5(4): 432-446, 2010. 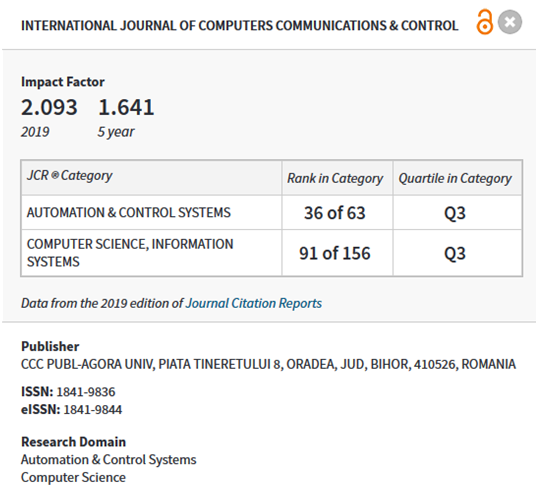 To differentiate from other similar journals, the editorial policy of IJCCC encourages the submission of ORIGINAL RESEARCH PAPERS (not survey) that focus on the integration of the 3 "C" (Computing, Communication, Control). T3. Advanced decision support systems (with particular emphasis on the usage of combined solvers and/or web technologies). The papers out of these topics will be REJECTED. Papers are accepted for review with the understanding that the same work has been neither submitted to, nor published in, another journal or conference. If it is determined that a paper has already appeared in anything more than a conference proceeding, or appears in or will appear in any other publication before the editorial process at IJCCC is completed, the paper will be REJECTED. in MS Word format (for evaluation only) with the following specifications: paper A4, font TNR 12p, single column. The manuscript must be uploaded online in PDF format only (< 30 MB). The manuscripts edited in two columns will be REJECTED. Beginning No.2/2014 the number of pages of one article is 8-16 (one column, A4). The manuscripts edited in two column format or in out of the accepted limits of 8-16 pages will be REJECTED. Your IP address will be registered for anti-spam reasons. You must enter the full name of the corresponding author, his/her institutional affiliation and his/her e-mail (PLEASE USE AN INSTITUTIONAL EMAIL ADDRESS RATHER THAN GMAIL, YAHOO, ETC. ), we will REJECT submissions that do not have these. You can update your profile before submission. The manuscripts submited by a corresponding author without a valid institutional e-mail address will be REJECTED. This file you will find instructions that will help you prepare the source file. Please, read carefully those instructions. (We are using MiKTeX 2.9). Any graphics or pictures must be saved in Encapsulated PostScript (.eps) format (a utility for converting jpeg images to PostScript Level 2 or 3 files (without uncompressing the images) is Jpeg2Ps which is freely available here. Checklist of documents which must be send by e-mail. F1. LaTex source (.tex file). F2. A folder with EPS files for figures (the name of this folder must be linked in .tex file). F3. Final PDF file (for reference). Submission fees are necessary to cover the cost of processing and monitoring submitted manuscripts, sending the manuscripts through our plagiarism scanning software, as well as minimizing fake papers submissions or frivolous submissions where authors submit manuscripts for free editing and correction with no intention of publishing with us. The submission fee is covers one submission to IJCCC and is non-refundable (for accepted and also for rejected submissions). Payment can be performed ONLINE (ask for a link to ijccc@univagora.ro). The number of pages of one paper is 8-16. Tax publication for 1 accepted paper (8-16 pages) is 500 EUR and can be payed online (ask fo a link to ijccc@univagora.ro). 1. I am authorized by my co-authors to enter into these arrangements. We understand that this journal is a member of, and subscribes to the principles of, the Committee on Publication Ethics (COPE). 2. I agree and warrant, on behalf of myself and my co-authors, that our authorship standards are total in accord of: Responsible research publication: international standards for authors ( Wager E & Kleinert S (2011), Responsible research publication: international standards for authors. A position statement developed at the 2nd World Conference on Research Integrity, Singapore, July 22-24, 2010. Chapter 50 in: Mayer T & Steneck N (eds) Promoting Research Integrity in a Global Environment. Imperial College Press / World Scientific Publishing, Singapore (pp 309-16). (ISBN 978-981-4340-97-7). 3. I, and all co-authors, agree that the article, if editorially accepted for publication, shall be licensed under Creative Commons in respect of Attribution-NonCommercial 4.0 International (CC BY-NC 4.0). ONLINE OPEN ACCES: Acces to full text of each article and each issue are allowed for free in respect of Attribution-NonCommercial 4.0 International (CC BY-NC 4.0. -Adapt: remix, transform, and build upon the material.